In order to reach the top you need to stand apart from the crowd! You have to be your own brand and also ensure that your brand is unique. You need to have a confident personality and a unique style to impress the people that matter. However, in this commercialized world it is very difficult to have a unique style. No matter which accessory you choose, you can be sure that there is another identical accessory being picked up by someone else. As there are so many brands, you might wonder that you can have a unique style with these brands. However, the hard truth is that you cannot have a completely original look unless you design the look yourself. Why Personalised Jewellery Is Good? Now, before you dismiss this option, we urge you to consider it carefully. Designing your own jewellery will allow you to get that extra something; you will be your own brand that cannot be copied. Say for example, a gold initial pendant necklace sporting your own initials. Can you think of anything more unique than that? Standard brands may have the best design but those designs can never be ‘you’. With a personalized accessory like this, you can select the design, the font, and even the purity of the pendant. Initial pendant necklaces which sports your first letters of your name are also great gifts. 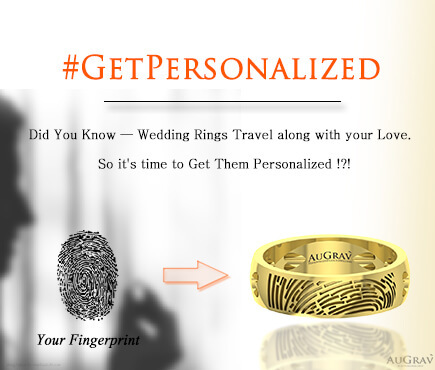 You can show your genuine love for a person by carefully designing a personalized item. We have different variety of alphabet pendant desings in gold that include S letter pendant, m letter pendant, letter R pendant, and letter A pendant . For example, if the accessory is for a child you can make it special by adding the child’s favourite cartoon. Imagine the kid’s joy when he/she sees a small Bhim holding up his initials; or a tiny Dora leaning against the child’s initials. The fact that such a necklace was made especially for him/her will make the initial pendant all the more special. Of course, not everyone likes to have their favourite cartoon character jewellery around their neck all the time. What if the person loves fashion? He/she would not appreciate such a childish gift. So instead of cartoons you add the person’s birthstones or favourite gemstones. You can make a design that suits his/her taste. Thus, with each necklace you are putting in your own thoughts and, more importantly, feelings about the person. So, now that you are hooked on the idea of an letter pendant with your initial you may be wondering how to make one. Well, a personalized accessory like this has to be planned out beforehand. AuGrav’s team is ever ready to help you out but you should have a definite idea of what you want before you approach the experts. Firstly, you have to think about the owner of this necklace. Depends on the material you choose, price of the alphabet pendant may vary. Our pricing range is starting from Rs.4500 to 14,250. Though we don’t have the silver initial pendant collections in our store, you can still contact our customer support to buy one for you. We at AuGrav, always customer oriented wanted to give all customization options to our customers. Is the person a fashionista or does the person prefer simplicity? Does the person prefer white gold or yellow gold? Or does he prefer rose gold? Should the initials symbolize the person’s name or an idea that he/she believes in? You have to think about all these factors and plan out the design. Then you have to think about the gold and other precious items in the necklace. Gold’s purity varies from 14karat to 22karat; please note that no accessory can be containing 24karat gold. The shine and malleability of the pendant varies according to the cartage and the type of gold you use. Also choose the number diamonds and other gems you want, to make diamond initial pendant necklace. Select the alphabet/letter that you want on your pendant. The letter may represent the person’s name or a nickname or a word that he/she likes. 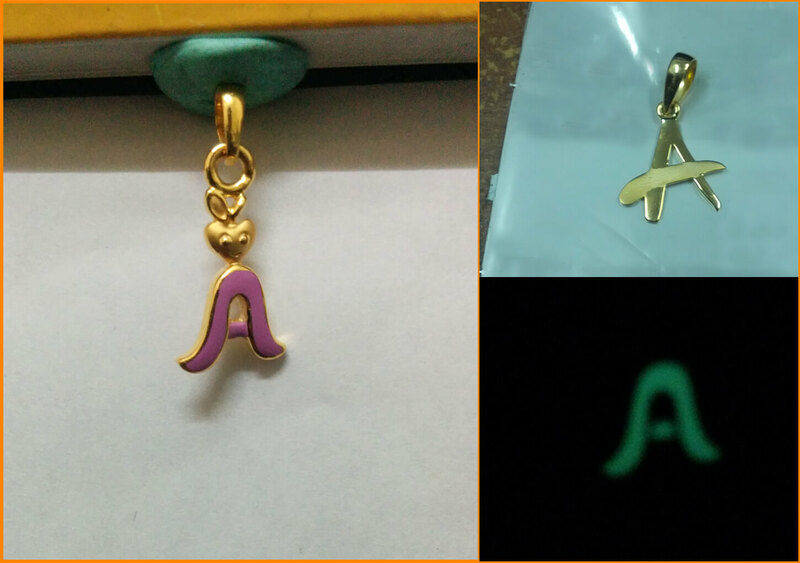 Pick the font that you want for the letter such as A, R, M, V and present the design for the pendant. Again, team AuGrav is there to help you if you have doubts about the design and the font. When you have finalized the design and font of the initial necklace, you will be given an estimate of the price based on the current gold rate in the market. You are required to pay 50% of the price in advance. Once the advance has been given AuGrav will show you a 3D rendered view of the necklace. Once you give your assent to the 3D design, the team will start working on the product and in 5-7 days you will have the alphabet pendant made in gold/silver in your hands! And there you have it! Your very own necklace initial pendant. Now, you can flaunt your own brand, be the envy of everyone’s eyes and enjoy the pride of being your own brand with AuGrav! 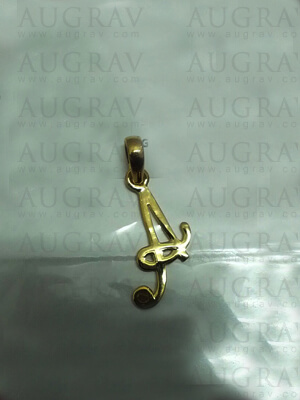 Buy Initial/Letter Pendants & Necklaces in India In 5 Simple Steps Overall rating: 4.7 out of 5 based on 235 reviews.